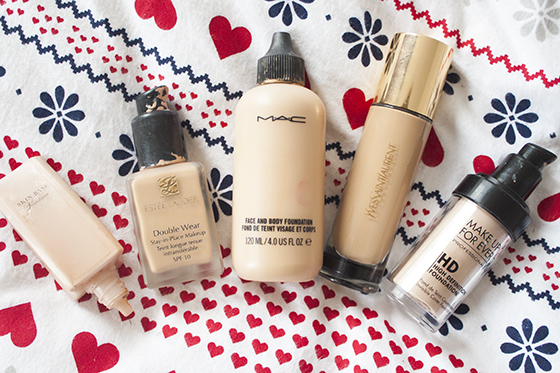 I'm a bit of a foundation addict. I literally have tons and tons of them and I probably like wearing about one of them. My skin tone is really really awkward, Im olive/warm toned but my skin is very pale, especially compared to the tone of my actual body. I've spent my life trying to tell MUA's that I'm OLIVE TONED NOT PINK TONED. Does anyone listen? Nope. Anyway I don't really tend to review foundations all that much on the blog as they are hard to photograph and show what they are really like on. I could use almost any foundation and have them look fine on camera but look completely different in person. Hence why I don't review them much as I find them pretty misleading! However today I'm gonna go through some of the ones I have, likes and dislikes and you could look further into them yourself! I will say before buying any foundation try and get a sample of it before you buy it, most high end counters will give you a sample if you ask. If they don't then that's their loss and don't buy it! Also Just in the interest of not making this post too long I shall do another one next week with some more of my foundations! Estee Lauder Double Wear : I have to admit Double Wear is my all time favourite foundation. I've used it on and off for years and I've never had too many troubles with it. It doesn't break me out but it's very easy to over apply and make your face feel a bit too cakey. It provides flawless full coverage with a very matte finish. I either wear Ecru or Desert Beige depending on how tan I am! MAC Face and Body : I hate most MAC face products but this one changed my opinion of the brands foundations. Face and Body is a lightweight, water based, waterproof long lasting sheer coverage foundation. It blends into the skin effortlessly and can be built up in areas that need more coverage. It doesn't contain SPF so is perfect for a night out and looks stunning on camera. The product is also really good value for money at for 50ML. I wear C3 which is the most perfect match I've had with a MAC foundation before! YSL Touché Éclat Foundation : This has to be the most annoying foundation I've ever tried. I love the flawless natural, dewy, luminous finish but it broke me out like no other foundation I've ever tried before. At first I didn't think it was the foundation breaking me out (or maybe I was trying to convince myself it wasn't!) but I came to my senses and stopped using it. Although I'd stupidly bought a full size at this point which to this day remains unopened! However the colour match was absolutely perfect (Im BD50) and the finish was to die for, but sadly I can't use it at all. I'm absolutely gutted as this would have been my Holy Grail foundation if it didn't break me out as everything about it was spot on! Makeup Forever HD Foundation : This has to be another of my all time favourite foundations and I really should repurchase it at some point. I've been clinging onto the bottle since I used it up a few months ago for some unknown reason. I was a bit so-so about this at first but it really grew on me towards the end. It looks incredible in photos and I wear it a lot when photographing for my blog. It blurs all imperfections, brighten the skin and cover blemishes with a soft semi matte, glowy finish. I wear 115 which is a good match for my natural face skin tone in terms of paleness but the tone is slightly off as I could do with something a little more yellow. Thank you for your reviews on foundation. I think every girl needs to know about foundation when she deals with make up. Foundation gives fresh look.To.. Continue reading:https://essaydune.com/.